Mowing your yard can be a tedious task, so leave this weekly chore to the Hamilton mow crew. Proper and sharp equipment is essential to making your lawn look the best in the neighborhood. We can recommend a quality management program to keep your lawn looking green, lush, and free of annoying weeds. There’s an array of services that we recommend if you’re interested in a pristine lawn but it’s important to factor in budget. We can help guide you in choosing the most important ones to help cater to your lawn’s particular conditions. Click on the tabs below to learn more about each service that we can recommend for your lawn. It’s important to understand why we recommend each service and how each one contributes to the overall health of your lawn. Water is perhaps the most important ingredient for a healthy lawn. With Cape Cod’s warm temperatures sustaining throughout the summer nights, without regular watering, it’s nearly impossible to keep your lawn looking green. Believe it or not, there’s a right way and a wrong way to water and Hamilton Tree and Landscape can teach you the proper way. We can manage your project from start to finish. This often requires contracting other professionals to lend their expertise to the project such as an irrigation company. We will work closely with an irrigation company when installing your new system whether it be for a brand new lawn or an existing lawn. A typical lawn management program of ours consists of 3 properly timed fertilizer applications annually. Some companies will recommend more applications, but our experience has shown that 3 applications is perfectly sufficient unless a lawn is showing signs of something called red thread. If a lawn is starving for nitrogen, we may recommend another properly timed application of fertilizer. Each of our applications has additives that help with other potential lawn issues. Lime applications help to neutralize the acidity of the soil. Weeds and moss love soil that is very acidic and lime helps the soil to be more basic. Our management program consists of 2 properly timed lime applications. We may recommend additional applications or double doses if a lawn is especially mossy. Also, if soil is too acidic, fertilizer is not as effective. This is why it’s important to both applications and not just one or the other. 1) It helps to reduce compaction in the soil to allow both fertilizer and lime to better penetrate and thus be more effective. Dethatching has some very similar benefits as aerating. You’ve probably heard that grass clippings can contribute to the overall health of a lawn. This is true; however, continued build-up of these grass clippings and other debris can start to cause issues. If a lawn has too much thatch, lawn applications such as lime, fertilizer, and grub control can not penetrate the soil in order to work their magic. Also, water and air, both essential ingredients for a healthy lawn, can not penetrate the soil if there is a layer of build-up. Moreover, moisture build-up with a lack of air flow is just a recipe for disaster as this can encourage pests and diseases to overtake your lawn. We use a machine that loosens a lot of the thatch and then we rake it all up. It sounds simple but it can be a laborious task – especially without a machine to assist! Ideally this service is performed once a year; however, we’ll be able to determine in the spring whether your lawn is in need of dethatching. Grubs can be very pesky because you often don’t know they are an issue until you start to see your lawn die. Grubs are the larvae of various beetles that one often finds in their landscape. These larvae feed off of the roots of your lawn and without roots, a lawn cannot grow. Moreover, animals like skunks love to eat these grubs, so your lawn can experience further damage when these animals are digging for food. We can recommend two kinds of treatments for the control of these critters: one is done as a preventative and is a slow-release granular product and the other is fast-acting and kills grubs within 24 hours. This is of course used when grubs are already an apparent issue. As always, it’s best to be proactive rather than reactive when it comes to plant health, but we can make an evaluation and make the best recommendations for your lawn’s current needs. Broadleaf weeds can be a nuisance in a lawn. These consist of clover, dandelions, Creeping Charlie, Nut Sedge, Barnyard Grass, etc. Luckily, there’s an herbicide that can be sprayed on an entire lawn and it only affects broadleaf weeds. This is a liquid application and we recommend it twice annually in the spring and fall when temperatures are more moderate. Soon after the application, you’ll see these weeds start to die. After a lawn mowing or two, you’ll notice that a majority of them have disappeared! It’s important to note that crabgrass is not a broadleaf weed; therefore, it requires a separate treatment, which you can learn about in the next tab. Crabgrass can often be found along roadsides or wherever a lawn is stressed. It doesn’t emerge in a lawn in our area until about July. Once it starts to emerge, it can be treated with a special crabgrass control herbicide but it has be done when the crabgrass plants are very young. It’s a very small window of time. Once the crabgrass plants are mature, it’s too late to do a post-emergent treatment on them. This is another example of the importance of being proactive rather than reactive. We recommend a pre-emergent crabgrass control to help inhibit the growth of the crabgrass later in the season. There are also cultural practices that can be done to a lawn to prevent crabgrass. These include a lot of the other services in the tabs above such as aeration and dethatching. Also, it’s important to not cut your lawn to anything shorter than 3 inches. 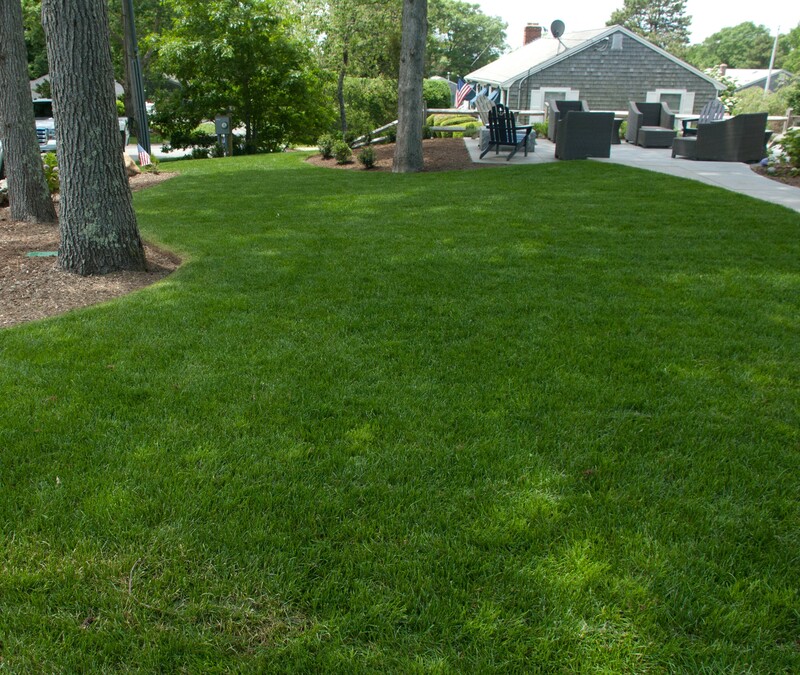 Some people prefer a lawn to be a bit shorter; however, Kentucky Bluegrass, which is the most common type of grass in lawns on the Cape, prefers not to be cut to anything less than 3 inches given the particular climate in this area. It basically comes down to this: a stressed lawn is a haven for crabgrass and other weeds. If your grass is well watered and overall healthy, there won’t be room for these weeds to grow in between the grass plants. Jesse and team, we were up in Cape Cod for Columbus Day weekend, and were struck by how beautiful, lush and green the grass looked, and how lovely the shrubs were, on our property. Thank you and the full team at Hamilton Tree for caring for our property so nicely.